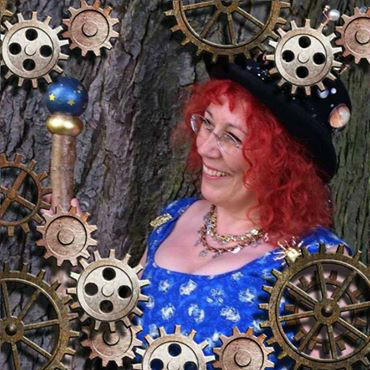 I’m making an orrery for my headdress and it is a wonderful learning experience. I needed it to be light enough to put on top of a hat but also sturdy. So far I’ve constructed it from the Sun as far as Mars. The Sun is a copper painted globe from a cheap pencil sharpener. I’m learning to bend garden wire into shape and use different pliers and hoping that a nylon threaded rod will be strong enough. My planets are a child’s 3D set and should glow in the dark – looking forward to that! Getting it to look as I want is a creative challenge. I keep reminding myself that it is merely a representation of something far more complex and beautiful. We are well into Leo as I write this and our Sun sign Leos should have had a rewarding time around 10th and 11th when the Moon was also in their own sign. As I write this on 15th – Librans can expect to be having an easy time, with Scorpios coming more into their own on 17th. This is of course very generalised. The only influence I’m looking at here is the Moon. An individual chart can give much more in depth information about the celestial influences on an individual. In fact, I now offer 6 month forecast reports. This is much more detailed than free online reports – hence 6 months rather than a year. Do please bear in mind that this type of report can only tell you what influences will be around you – it cannot control the way in which you respond or react to these influences. Astrology can never take away your free will. Armed with the knowledge of the interactions of ‘progressions and transits’ with your natal chart however, you have the opportunity to bring each influence to the best possible outcome. Each report is an average of 20 sides of A4 with a parchment frontispiece and beautifully presented. You can even have input into the design of the frontispiece if you want. Some wording, fonts and imagery can be personalised to suit you. Head on over to my shop to have a look. I think my next blog will have some exciting news to stay tuned!